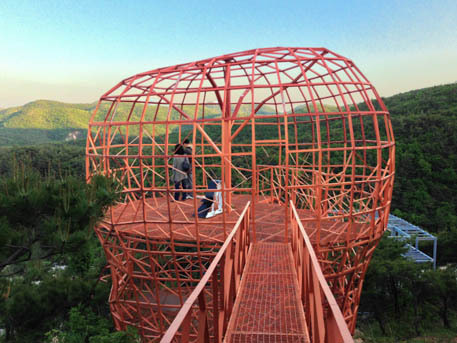 Gangwon Province is ideal for people who love to get outdoors. Over 80% of this region is mountainous, with the East Sea at its border. 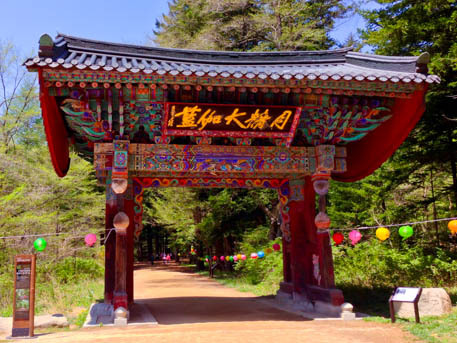 Gangwon Province has four-season ski resorts and is home to Sorak Mountain National Park, featuring soaring cliffs and magnificent hiking. Click here for more information. 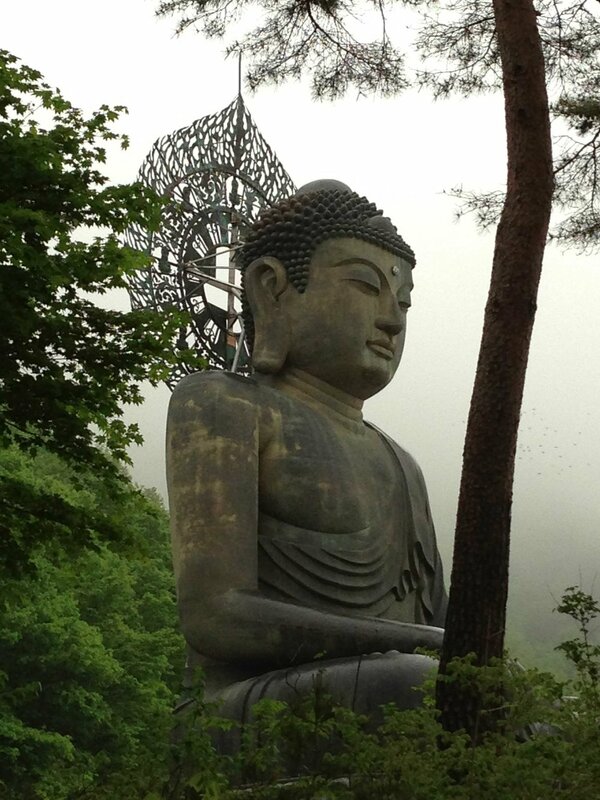 This trip to South Korea occurred during Buddha's birthday, so we drove to Gangwon province in the north-east coast of South Korea for the long 3-day holiday weekend. 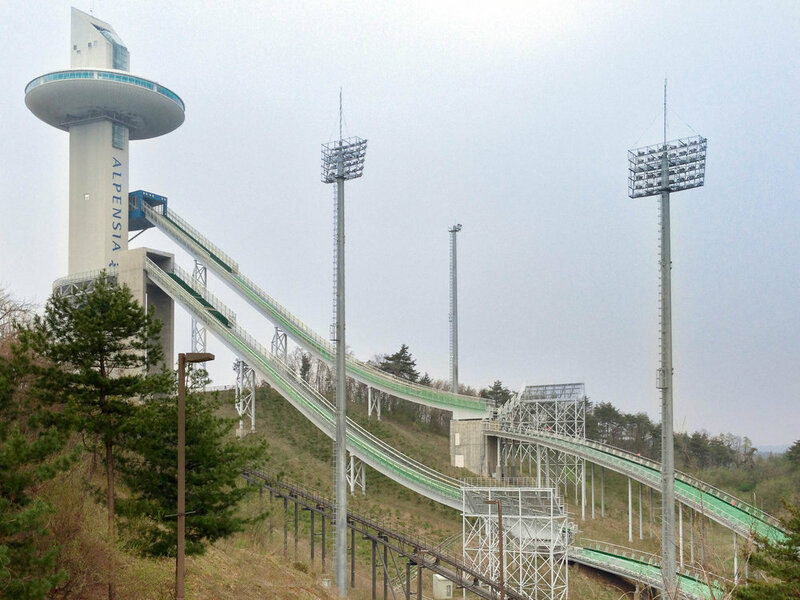 Our destination on Friday was Yongpyong Ski Resort in PyeongChang, the site of the 2018 Winter Olympics! 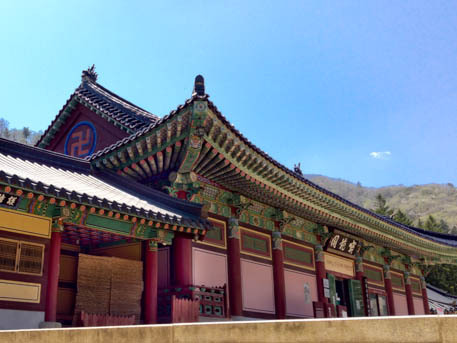 Along the way, we traveled through Odaesan National Park to visit Woljeongsa Temple and then had lunch -- dumplings and sweet & sour pork (만두 & 탕수육) -- at Jin Tae Won restaurant. We ate WAY too much sweet & sour pork! 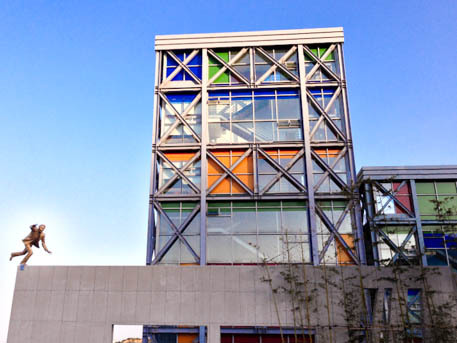 Later, after checking into our hotel room at Greenpia Condominium, we took a short drive to Haslla Art World, a quirky art and design museum on the coast of the East Sea. We arrived late, though, so we just explored the outdoor park. 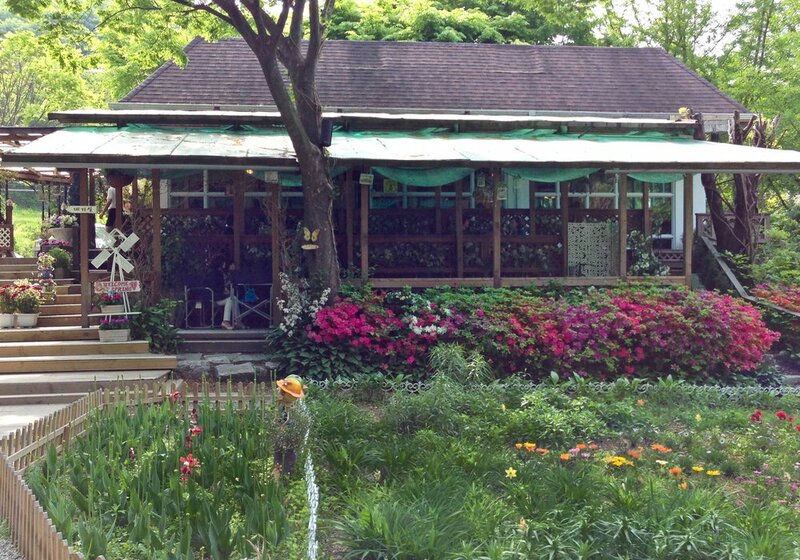 With the sun setting, we stopped for a dinner of bean paste vegetable stew (it is a thousand times better than it sounds) at Hwang Tae Hwaekwan. It was marvelous!! Up early for a heart-thumping run up a 12% incline to the Alpensia Sports Park, the 2018 Olympic venue. The site of the ski jump was exhilarating! Then we rode the gondola for a bird's eye view of Yongpyong at 1450 meters above sea level. 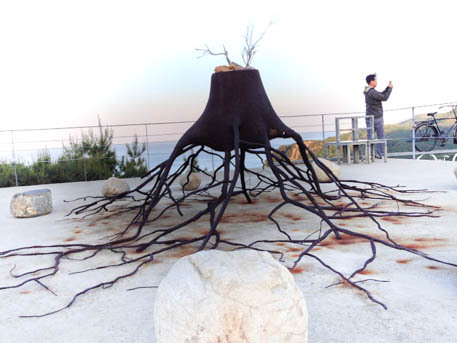 Fans of the drama "Winter Sonata" may recognize the scenery! 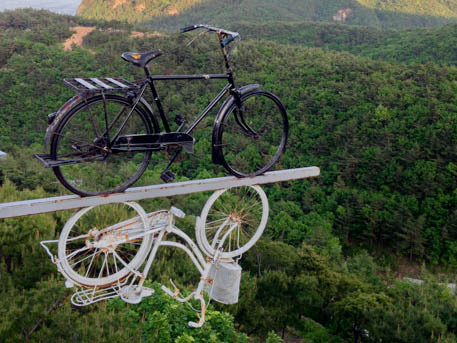 Since we were visiting the 4-season resort in Spring, the gondolas were transporting mountain bikers and view-seekers alike. 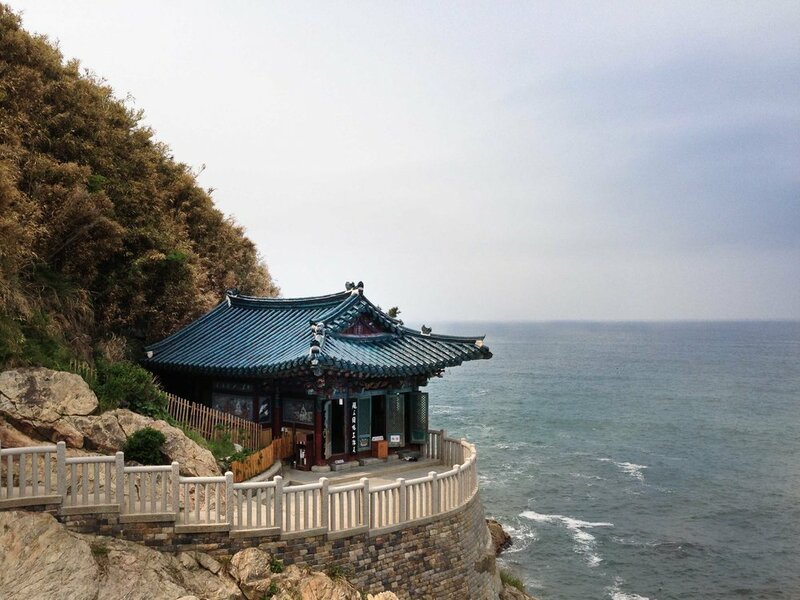 After checking out of the resort, we headed to Sokcho on the East Sea coast. 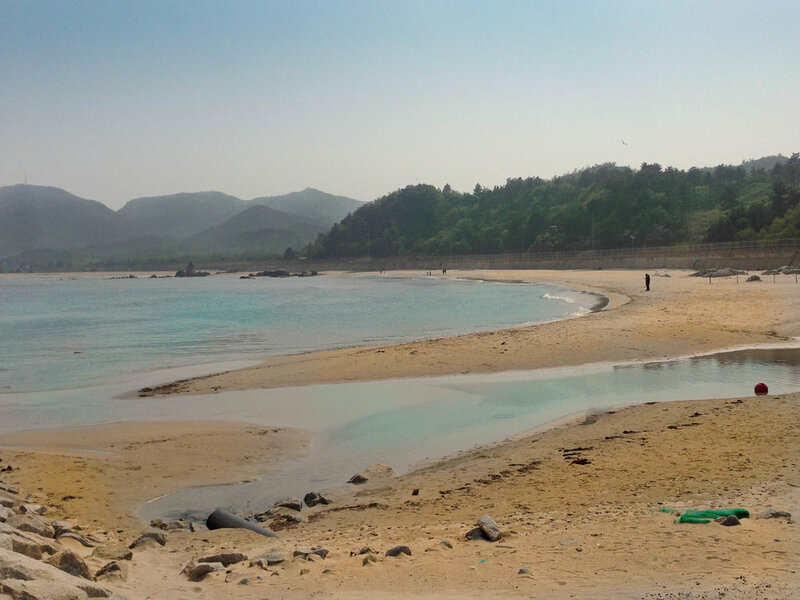 Our first stop was Gojinup Beach (거진읍) for a quick toe-dip in the ocean and then on to lunch at a sushi house in Kajin Harbor (가진항). The sushi house is actually a collection of small, independent sushi restaurants, each with its own reputation. The one we chose was packed, while the tables right next to us run by other shops were empty. I'm not sure what the reputation is based on, but I think we made our selection due to a particular menu item. We ordered "normal style water sashimi" (일반물회) served with noodles (국수). Because I was not exactly certain what seafood was in this cold, vinegary soup, it was a test of my open-mindedness, for sure! It was delicious, once I got over some of the new textures. After lunch, we explored Sokcho a bit, stopping by a pristine lakeside park (화진포) where former President Sung Man Lee had a retreat. The lake was smooth as glass! At a brief stop in Sokcho's Fish Market, we carried out some of Sokcho's famous stuffed squid and fried chicken, which we had for dinner after checking into Hanwha Resort for the night. Great pictures of the sushi place and "normal water sashimi" are here. 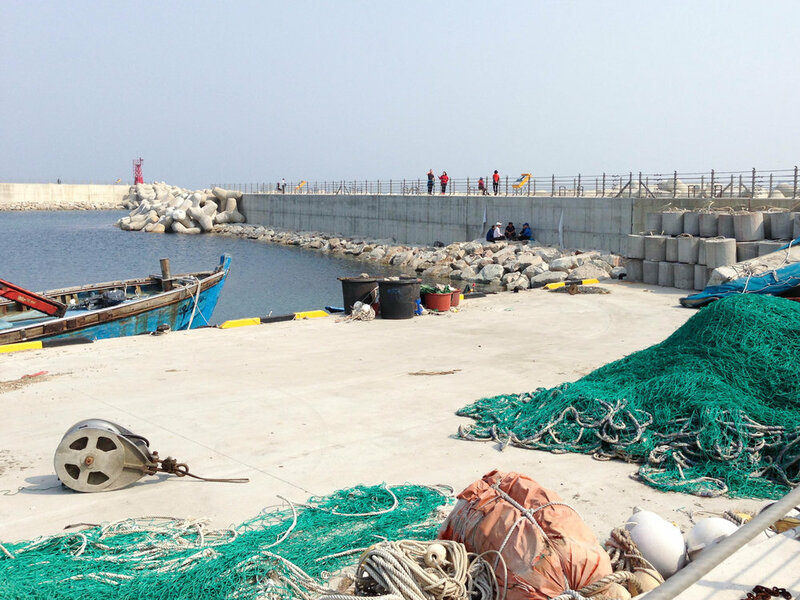 Photos of Sokcho's Fish Market are here. 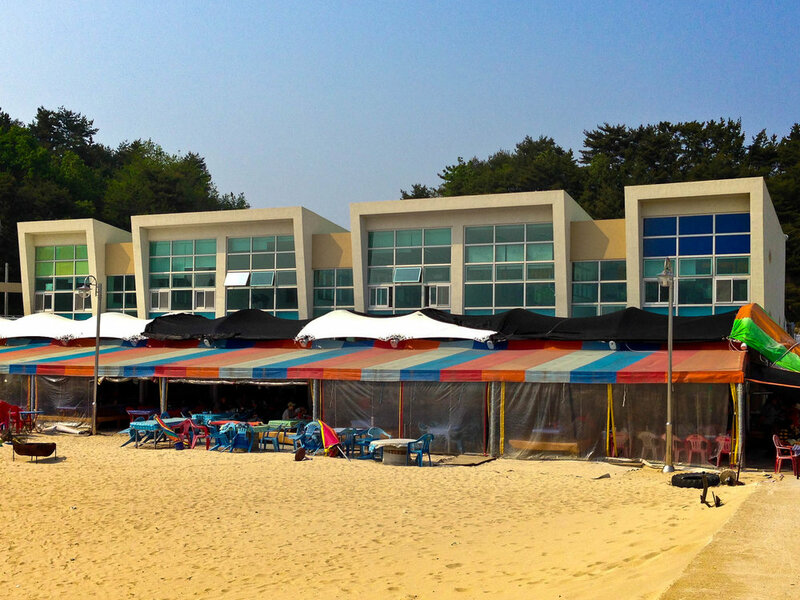 NOTE: If you visit Sokcho, you absolutely must have stuffed squid, which you can't find anywhere else! 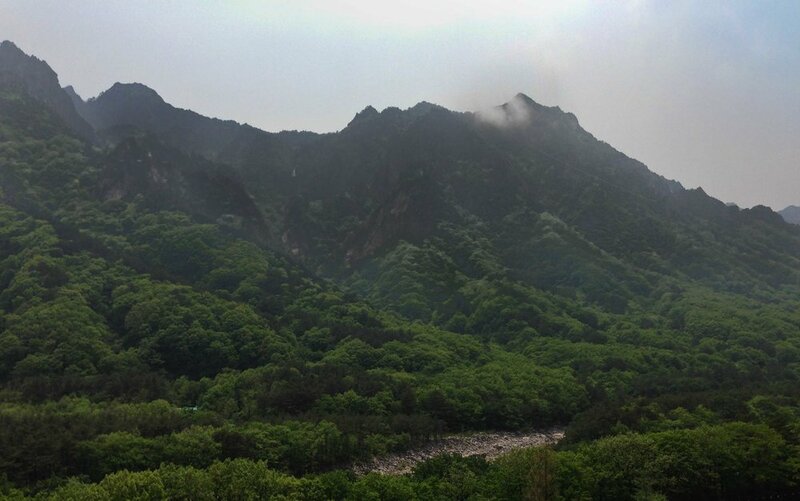 Seorak San (San 산 = Mountain) is the highest mountain in the Taebaek mountain range in North East Korea. 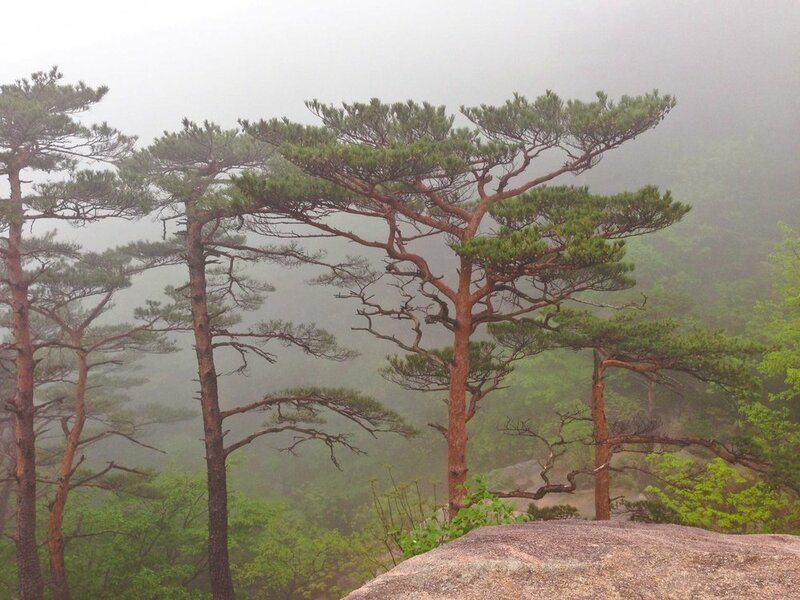 The actual peak we hiked is Ulsan-bawi (울산바위). The morning was cloudy, with a slight drizzle. We could not see much as we climbed, but the mist created a mysterious, tranquil mood. As we neared the top of the peak, we witnessed an awe-inspiring duel of nature. We had been hiking in a fog, surrounded by a blanket of white. Within minutes, air warmed by the sun on the opposite side of the peak chased the clouds downward, revealing the distance peaks. The cold air retaliated, pushing the fog back up. 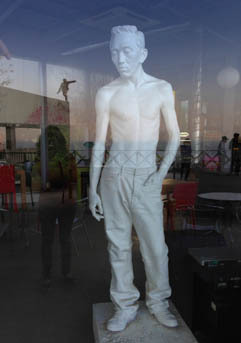 We could feel the tug of war in the changing air temperature, the warmth retreating and then advancing; the distant view disappearing and then re-appearing. The route we chose for our hike passed by several temples and prayer places, as well as a few water falls. We arrived very early, so we avoided the crowds and enjoyed the serenity and peaceful quiet. We did learn, though, that the shops do not open until 9:00 am, so we hiked without supplies. 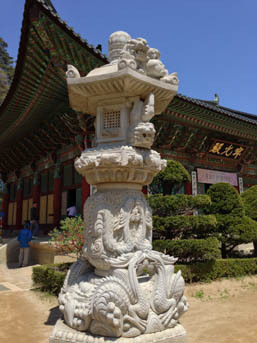 After breakfast, we visited Hongnyeonam Temple (홍련암) on the shore. 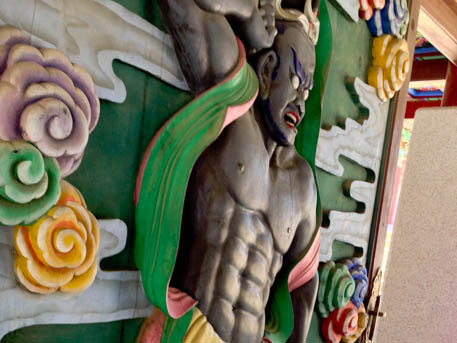 Since its founding in 676, the temple has been rebuilt many times -- as recently as 2002 following a tragic fire. 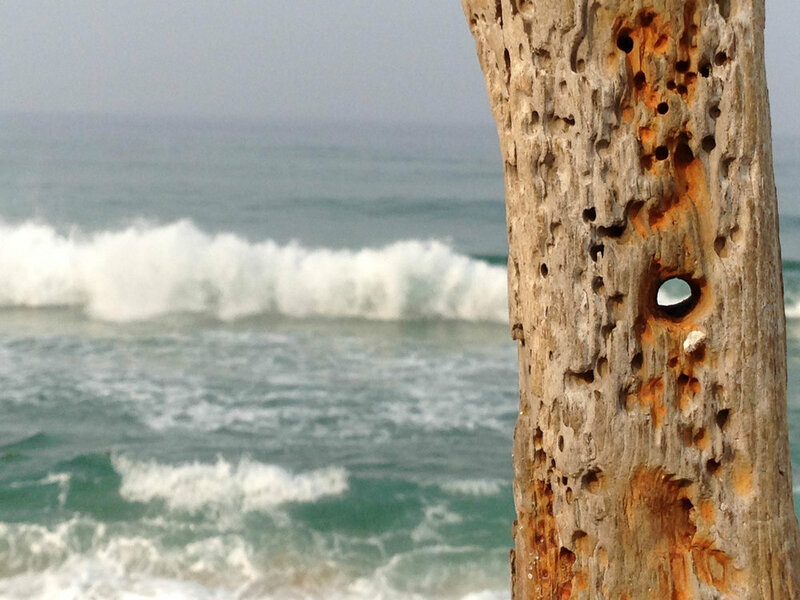 The sound of the crashing waves and the warm wind blowing from the sea was calming. There is a lot to see and learn here, so plan to spend a considerable amount of time walking and contemplating. Dinner was at Sokcho Jinyang Sushi House (속초 진양횟집), a small tastefully-decorated restaurant where we ate like royalty! The owner was a beautiful older woman, who seemed to enjoy spoiling us! For the adventurous eater, try the sea cucumber with a little gochujang (red pepper paste). On our final morning of this trip, we enjoyed coffee and an enviable view from the balcony of the Kensington Hotel, which is located just outside of the Sorak San park entrance. After filling our lungs and souls with rich mountain air, we headed back to the city. 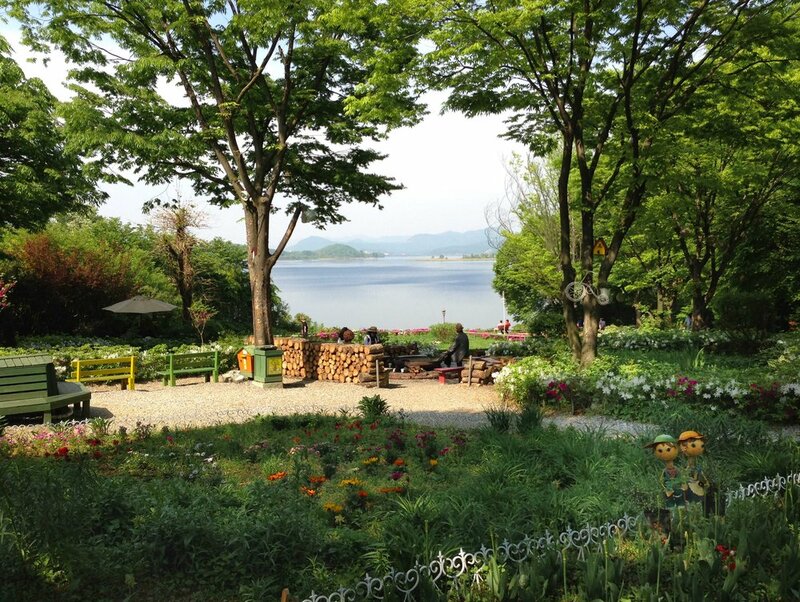 Not quite ready to return to the hustle and bustle and still yearning for a bit more nature, we stopped on the east edge of Seoul to have lunch at a riverside restaurant known for acorn jello (묵 "mook") dishes. In English, the restaurant translates as "River Village Squirrel" restaurant. In Korean, it's pronounced Kang Ma-eul Da-ram-chwi (강마을 다람쥐). 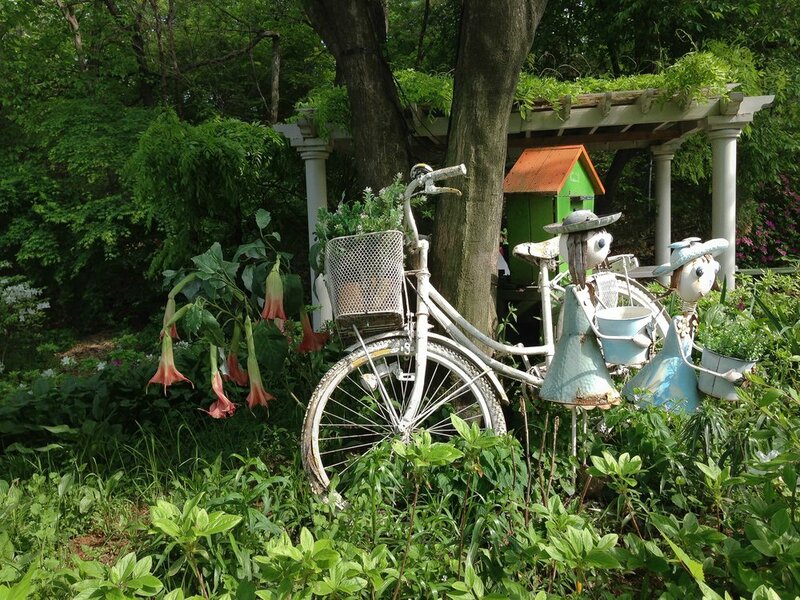 It is the perfect place to stretch tired legs, relax on a swing, and enjoy the fragrant flowers and quirky garden elements. The food is unique and absolutely divine! We savored cold, vinegary soups (냉면 "neang-myon") and mixed rice bowls (비빔밥 "bi-bim-bap"), both loaded with fresh veggies, slices of acorn jello, and chewy brown seaweed (톳 나물 "tote namul"), fresh salads, and an acorn-flour wrap with kimchi fried rice inside. To view photos of the foods described and see more pictures of lovely Kang Ma-eul Daramchwi, please visit this Google images link. After our late lunch, we completed our journey back into the city. Passing through the city center, it felt like Christmas with lights ablaze for Buddha's birthday. Fitting end to a vibrant trip.